Respect. Responsibility. Effort. Pride. Honesty. These are the “8 Great Traits” my kids’ elementary school values. Each month throughout the school year, a particular trait was highlighted. Teachers then selected one student from his or her class to receive a medal for demonstrating that trait. 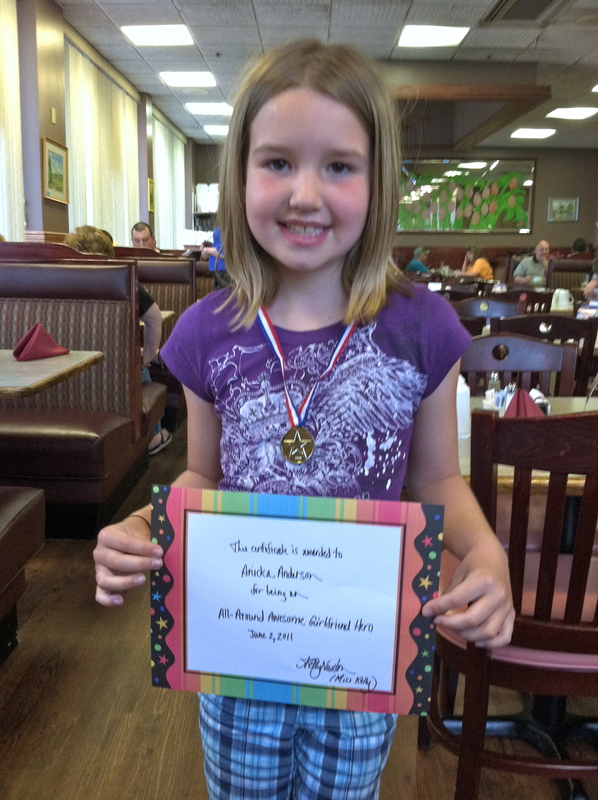 At the end of the year, however, one grand medal, the “All-Around Hero Award,” is awarded to a student from each class who best modeled all of the traits. 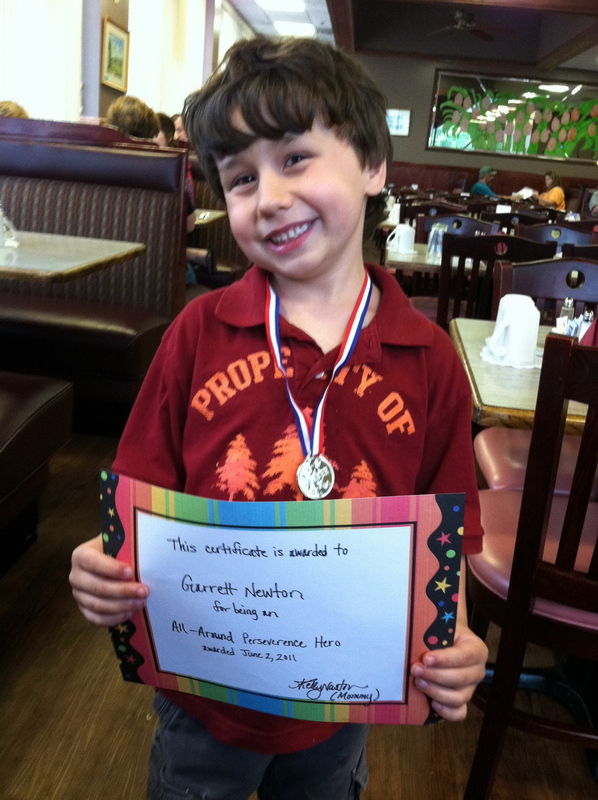 Garrett has said little throughout the year regarding the medals. That is…until two days ago. I had absolutely no idea what to say. I told him it would be great if he did, but even if he didn’t, I was proud of him nonetheless. I found myself thinking quite a bit about the medal. Ideally, it would be great if they both won. 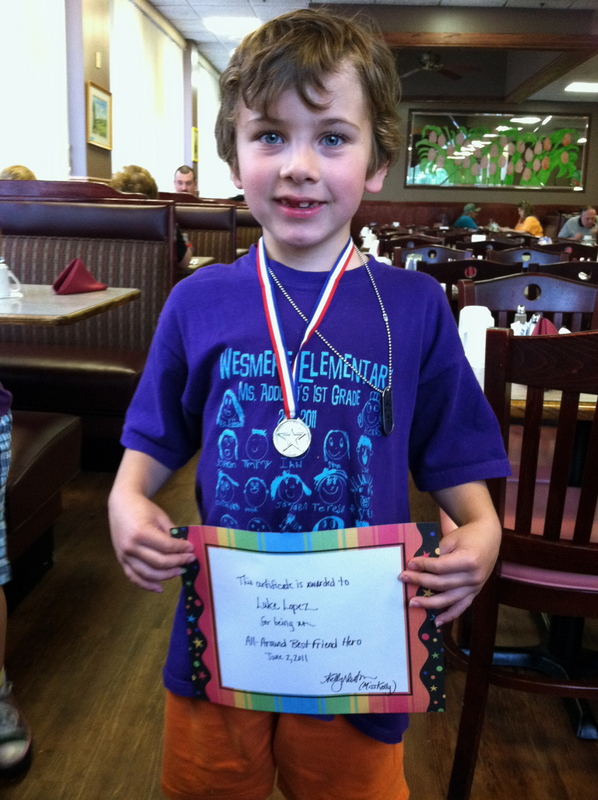 However, if Ava won the medal and Garrett didn’t, I wasn’t sure how he’d respond. 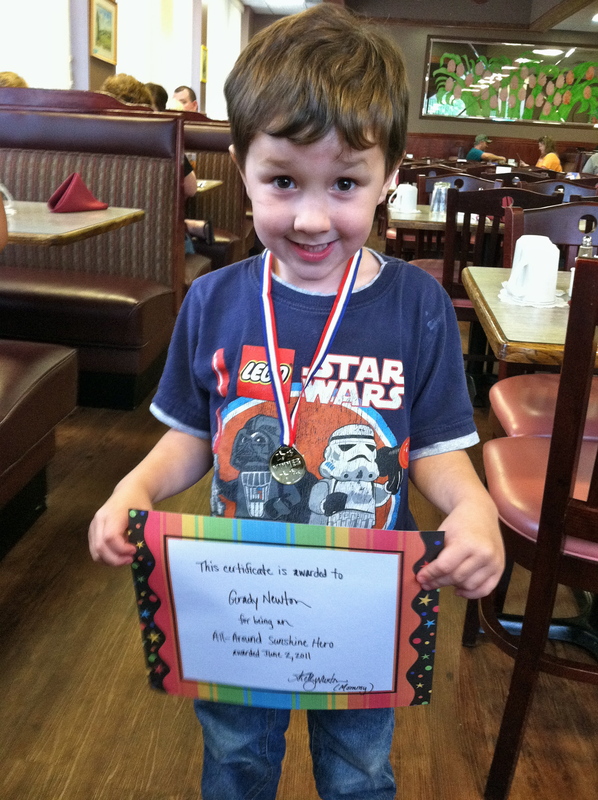 And then I thought about Grady: would he feel left out if his siblings each came home with a special award? A part of me considered perhaps I wasn’t giving my kids enough credit and was possibly underestimating the attitude they would have. And then there was another part that thought this could be a great “be a good sport” teachable moment. After all, not everyone gets the top prize and of course the kids are going to experience disappointments throughout life. So, may as well start prepping now, right? Ahhh, the woes of an over-thinking mother! Oh, so what to do? Well, the includer part of me ended up taking over and I decided we’ll deal with how to respond to disappointments another day. Yesterday, I just wanted an all-around happy day. 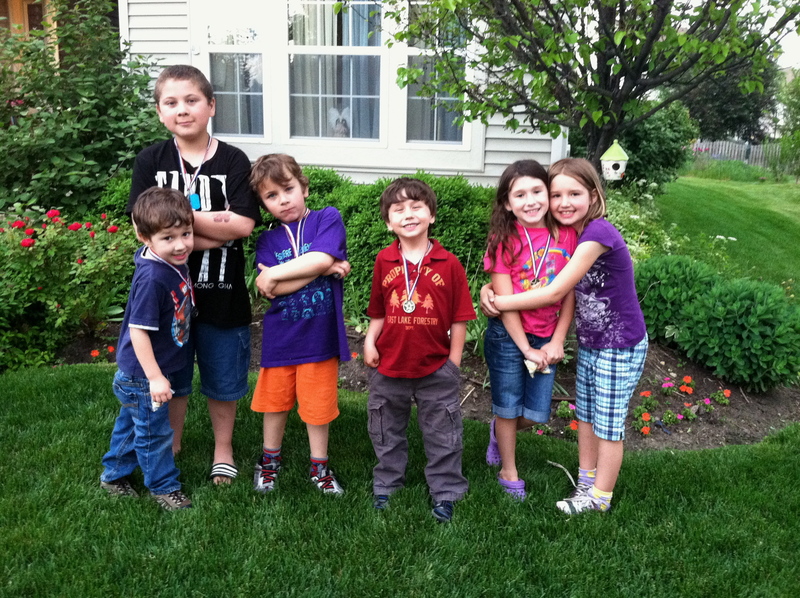 We’ve been staying with neighbors this past week, so the kids could finish out their school year here in Plainfield. 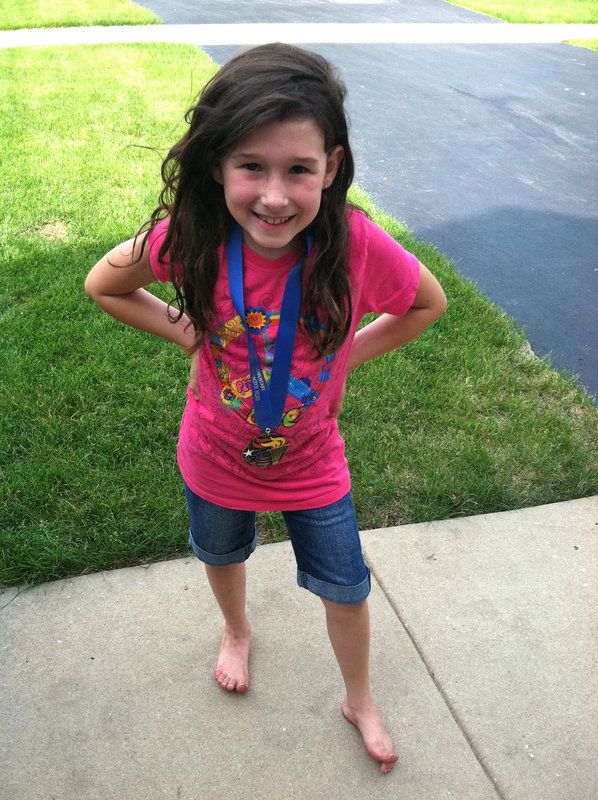 Ava stayed with Anicka and her family, while the boys and I stayed with Luke and his family. These are the homes of my kids’ best friends. So, then it hit me, “Why not celebrate each of the kids?” The school medal is awarded for what takes place in the classroom. But, it created for me the perfect opportunity to honor not only my kids, but their friends too for what took place in my home. After all, I’ve been loving them for the past decade and I wanted them to know from me personally what I value about them as individuals and the impact they’ve had on me, my kids and my family. I went to Party City and bought a package of medals. I then found some decked out paper and made a certificate for each of them. 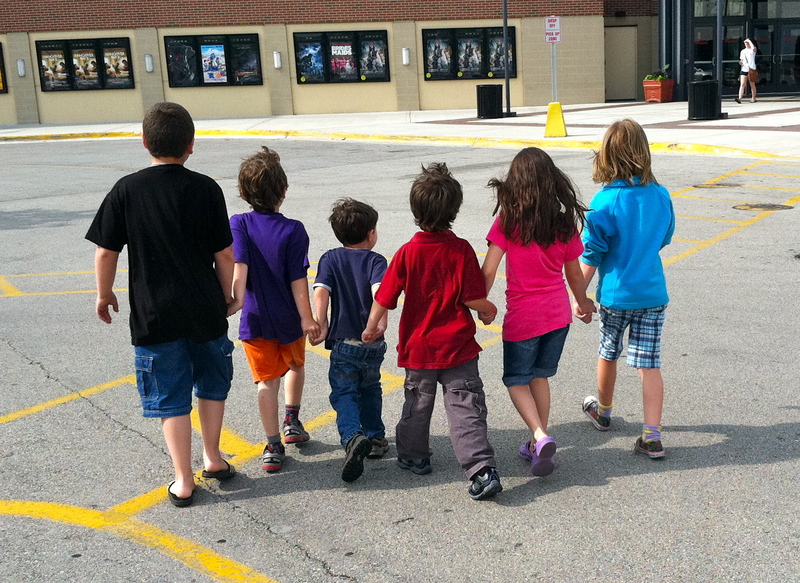 I previously arranged to take the kids and their best friends to see Kung Fu Panda 2 that afternoon followed by eating dinner out. All the pieces were falling neatly into place and I hoped they would enjoy my surprise. After school, I was greeted by a sea of smiles. 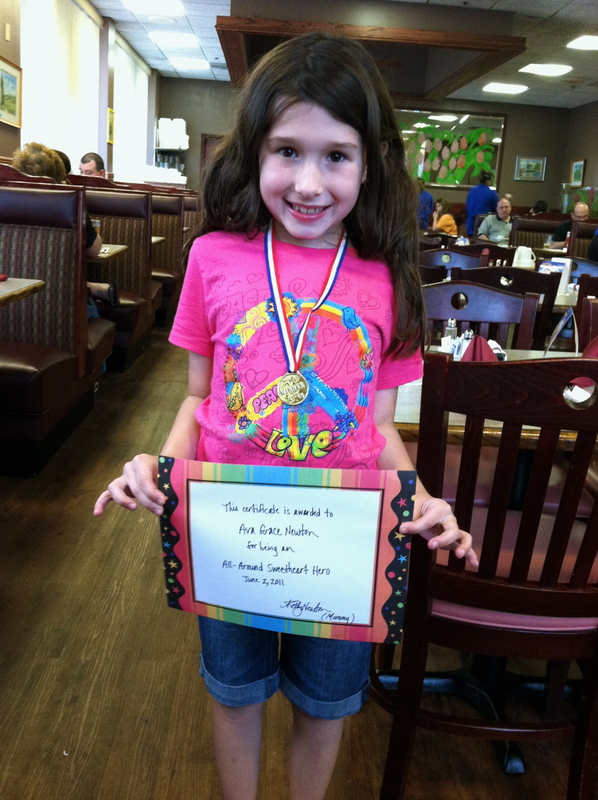 Ava did indeed win the medal for her class. Garrett did not, but I could not have been more proud of how happy he was for his sister (and that was without me reminding him!). Kung Fu Panda 2 was awesome! All the kids and I really enjoyed it. I decided to hold my medal ceremony during dinner and that was fun too. I was afraid I might get choked up, but the ambiance in the room was light and everyone was laughing at the table, so things went smoothly. After calling each of the kids forward and bestowing their medal and certificate, we’d all applaud for each other. It was an afternoon I’ll always treasure. When we found out I was pregant with Grady, Ava prayed he would be a girl. She wanted a sister soooo bad! Well, God did not give Ava a sister, instead He gave her Anicka. The friendship these two girls have shared has been a blessing. In fact, one of the most difficult parts of our move was not only leaving behind our family, but these dear friends. Anicka has been Ava’s sister: they support one another, love each other, still have the occasional bickering, but are always there for each other no matter what. I couldn’t have asked for a better friend and playmate for Ava and I am thankful for the role she has, and I pray, continues to have in my daughter’s life. Ahhh, our sweet Luke. I am going to miss seeing his face pressed against my backdoor when he comes over looking to play with the kids. This past year, he stayed with us before and after school. I know he loves cinnamon rolls, playing “Sorry!” (he always beats me…), and getting the “blue” cup for breakfast. He has the most endearing personality and you can’t help but smile when you’re around him. He rough-houses with the boys, but they are still careful with each other. He loves trading silly bands with the girls and is so considerate. In fact, if not for him, I don’t think my kids would put their dishes in the sink when they finished with them. He succeeded in teaching them that, even though I tried. I am thankful my boys had another brother in him. “Miss Kelly, can I help you with anything?” I would hear that phrase from his mouth every day during the time he stayed with us before and after school. Even when I pulled up late Monday night, Charlie was right there, unloading my suitcase from the vehicle and bringing it to my room. I can’t believe he’s going to be a 7th grader! As the oldest of the group, he’s played the big brother role well. He’s responsible and watchful over the kids. And, he is currently giving me a crash course in “iPhone for Dummies” – extra bonus! Ava cares for people and goes out of her way to show it. She loves making pictures and writing letters to her friends and family. Whenever we’re out shopping, she is quick to point out how so-and-so would enjoy a particular item and is a good friend. I am very proud of my the young girl my daughter is becoming. Garrett works so hard! 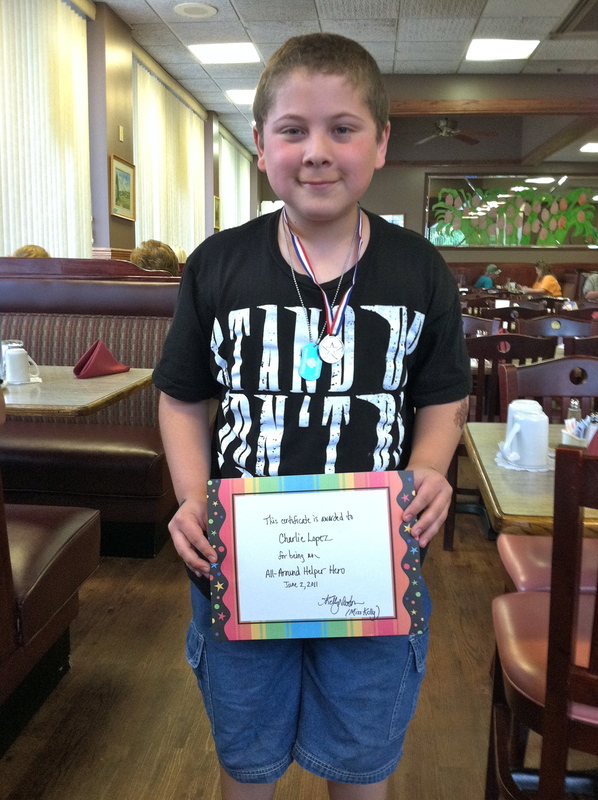 He is excelling in school with his reading and especially in Math. There are times when he may want to give up, but give him just an ounce of encouragement and my boy pushes right on through. I remember how many afternoons he and I spent working on making the lower-case “e.” He eventually got the hang of it and now makes them with ease. I am so proud of him! I wasn’t sure how Grady would react to me calling him a sunshine hero. It doesn’t sound too boyish, but I couldn’t think of a better word to describe him. This boy lights up a room the moment he steps into it. He makes me laugh with his impish antics and silly stories. He has a smile that melts your heart and like my other kids, I am very proud of him too. I know this has been a very long post, but how could I not pay tribute to a decade of cherished relationships? I mentioned in my last post, I want my kids to know I value what they value. Today, I share with you I also value who they value. Thank you, my sweet neighbors for blessing my children with your friendship. I love you so much and will miss you dearly. Nothing like a good cry to start a Friday morning. I love that you honored the kids in this way. They will remember that for a long time. I’m with Adam on the crying part. My eyes filled with tears as I read your story. I also have come to know your sweet neighbors as they all called me Grandma Bev. Kelly you are so blessed to have such wonderful neighbors and playmates for the kids. It reminds me of the friendships we all made with our neighbors on Hawthorne in Pekin and on Sage in Rockford. It is a bond that will carry on with all of you forever. Grandma Rita told me on the phone tonight not to cry tomorrow when I see you and the kids get in the car and head to Tennessee for the final time. I will try but I don’t guarantee it. I know I will see all of you in July but there is just something about the sadness of all of you being so far away. Hopefully when your Dad retires we will move a bit south. Love you! We’ll be waiting for you until you and Dad join us. The kids and I are very excited to see you tomorrow – love you so much!